While the boss is out of town, I'm scheduled to work Monday thru Saturday this week. 4 down, 2 to go! I'm exhausted and cranky, so I've warned my family!!! 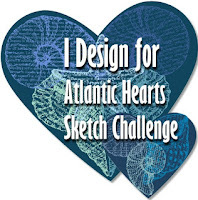 Not much stamping is going on this week, but I did get this card done using the fun and fabulous sketch over at Atlantic Hearts Sketch Challenge. I'm participating in a swap and one of the 3 categories I signed up for was Christmas (I hope no one that I'll be swapping with reads my blog!!). This sketch really helped me out. Red, navy, and green are perfect holiday colors, don't you think?!!! Now I must go finish my cards so I can get them in the mail! !